Thousands of students took to the streets of the Algerian capital on Tuesday, again calling for President Abdelaziz Bouteflika's departure after he refused to quit. University professors and medical professionals took part in the demonstration on Tuesday, which marks the anniversary of the Algerian war of independence, an AFP correspondent reported. Bouteflika, who has ruled Algeria for 20 years, confirmed on Monday that he will stay on beyond the end of his term of office next month. He announced on March 11 he was withdrawing from his bid for a fifth term, initially sparking elation among protesters before they realised he planned to remain in office regardless. The ailing 82-year-old also scrapped the election set for April 18 and announced he was rolling out reforms through a "national conference". Rarely seen in public since a 2013 stroke, Bouteflika issued a statement on Monday which confirmed his new plan would see him stay in power for months beyond the expiry of his term on April 28. On Tuesday, protesters chanted: "Students are angry, (we) refuse the extension." 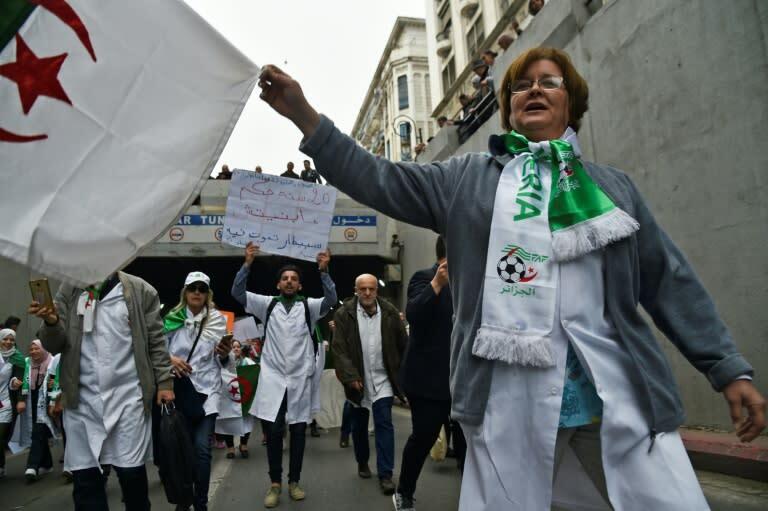 Last week, for a fourth consecutive Friday, demonstrators marched through Algiers to step up demands for Bouteflika to step down.